The quiet & peaceful town of Sanchi in Raisen District of Madhya Pradesh, India is synonymous with Buddhist Stupas – a series of hemispherical structures typically containing relics of the Buddha or his followers. The Stupas of Sanchi were constructed on the orders of Emperor Ashoka to preserve and spread the Buddhist philosophy. Sanchi has been protecting these beautiful and sacred architectural wonders, just the way these wonders have been safeguarding ancient history and art of the Mauryan period. The numerous stupas, temples, monasteries and an Ashokan pillar have been the focus of interest and awe for global audiences as well. In fact, UNESCO has given the status of ‘World Heritage Site’ to the Mahastupa. Apart from archeological value,the Sanchi Stupa’s shows the journey towards enlightenment. These structures also explain how Buddha achieved enlightenment, freeing himself from the cycle of life and death. The Stupa consists of a base bearing a hemispherical dome (anda), symbolizing the dome of heaven enclosing the earth. It is surmounted by a squared rail unit (harmika) representing the world mountain, from which rises a mast (yashti), symbolizing the cosmic axis. The mast bears umbrellas (chatras) that represent the various heavens (devaloka). A visit to Sanchi will bring alive the awe you felt as a child as you listened to the tales of Ashoka. The Sanchi hill goes up in shelves with Stupa No. 2 situated on a lower shelf, Stupa No. 1, Stupa No. 3, the 5th century Gupta Temple No.17 and the 7th century temple No. 18 are on the intermediate shelf and a later monastery is on the crowning shelf. The balustrade surrounding Stupa No. 2, carved with aniconic representations of the Buddha, was added in the late 2nd century BC under the Satavahanas. The adjacent Gupta temple no.17 was hailed by Sir John Marshall as one of the most rationally organized structures in Indian architecture. Though small, it was a herald of all the principles which went into the engineering of an Indian temple in the early medieval period. The Buddha’s in the perambulatory surrounding Stupa No. 1 are not contemporary with the Stupa but belongs to the Gupta period in the mid-5th century AD. The monastery and the temple with the tall pillars adjacent to Stupa No. 1 and the temple near the monastery on the crowning shelf illustrate the evolution of the architectural form after the 5th century Gupta temple. 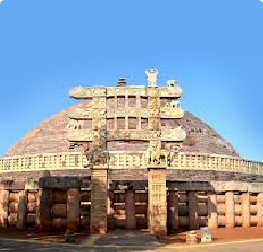 Emperor Ashoka built the great stupa and made the town of Sanchi sacred as well as popular in 3rd century BC. But a British cavalry officer rediscovered and revived the sacredness of the town in 1818. Buddhist influence over the central Indian landscape had declined by the 12th century and the stupas and other monuments slipped into obscurity. As Buddhism recessed, these architectural marvels were no more considered useful, and eventually, were completely forgotten. It was in the year 1818 that British officer General Taylor discovered the site of Sanchi. He set about restoring its glory. Between 1912 and 1919, these beautiful ancient structures were restored to their present condition under the able supervision of Sir John Marshall, Director-General of the Archaeological Survey of India. Today around 50 monuments remain on the hill of Sanchi, narrating the rise and fall of Buddhist art and architecture. Located in a close viscinity to Sanchi are the famed Udayagiri caves. These ancient caves,built during the reign of Chandragupta ll, has all the features that gave Gupta art its unique identity. The Udayagiri Caves feature some of the oldest Hindu images and cave temples in India. Udayagiri is best known for a series of rock-cut sanctuaries and images excavated into hillside in the early years of the fifth century CE. The site is notable for its ancient monumental relief sculpture of Hindu god Vishnu, in his incarnation as the boar-headed Varaha, rescuing the earth symbolically represented by Bhudevi clinging to the boar’s tusk as described in Hindu mythology. The best time to visit Sanchi is between Sept to March. The nearest railhead is Bhopal, which is also an important junction of the West Central Railways. It is also the terminus of the Shatabdi Express, which shuttles daily between Delhi and Bhopal. Various express trains ply between Bhopal and cities like Delhi, Mumbai, Agra, Gwalior, Jhansi and Ujjain. One can reach Bhopal by train and avail a bus / car from there for Sanchi. We offer customized & tailor made packages for Sanchi as per the requirement of the guest.